Donald Trump has officially picked Texas oil executive Rex Tillerson to be secretary of state, going ahead with the Exxon Mobil CEO's nomination despite early signs of unease over his close relationship with Russian leader Vladimir Putin. President-elect Donald Trump has officially picked Texas oil executive Rex Tillerson to be secretary of state, going ahead with the Exxon Mobil CEO's nomination despite early signs of unease over his close relationship with Russian leader Vladimir Putin. Tillerson, the first Texan selected by Trump for his Cabinet, is likely the president-elect's most controversial appointment yet. Some senators have already signaled they may oppose his nomination over concerns about his ties to oil-rich Russia, which the CIA has reportedly concluded interfered in the presidential election in favor of Trump. Trump nonetheless moved forward with Tillerson's nomination, making it official in a statement Tuesday morning. "Rex knows how to manage a global enterprise, which is crucial to running a successful State Department, and his relationships with leaders all over the world are second to none," Trump said. "I can think of no one more prepared, and no one more dedicated, to serve as Secretary of State at this critical time in our history." Born in Wichita Falls, Tillerson is a distinguished alumnus of the University of Texas at Austin. He currently lives in Irving, where Exxon Mobil is based. 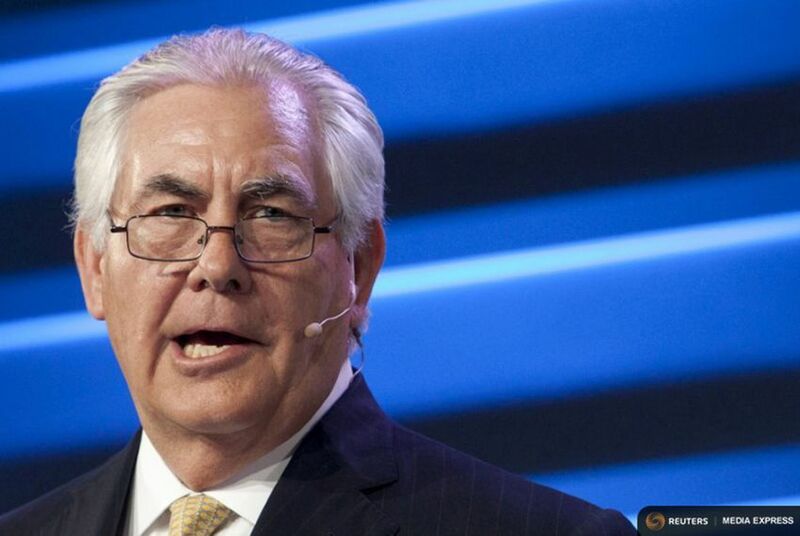 Tillerson has spent more than four decades at Exxon Mobil, becoming its chief executive in 2006. He was due to leave company in March, when he will reach the company's mandatory retirement age of 65. At Exxon Mobil, Tillerson has extensively done business in Russia, building a reputation as one of the closest Americans to Putin. In 2013, Russia gave Tillerson its Order of Friendship distinction. It's those Russian connections that could now lead to a tough confirmation battle for Tillerson. After word got out Saturday that Trump was zeroing in on Tillerson, at least three GOP senators voiced concerns. Among Texas Republicans, however, early reviews of Tillerson's nomination were positive. His nomination was cheered by multiple congressmen, fellow oilman T. Boone Pickens, Lt. Gov. Dan Patrick, Railroad Commissioner Ryan Sitton and U.S. Sen. John Cornyn. U.S. Sen. Ted Cruz, however, was more cautious, praising his fellow Texan but not making clear he immediately supports him for secretary of state. "Rex Tillerson is a Texan who has had an incredible career building one of the world's largest businesses," Cruz said in a statement. "With deep expertise in energy, he has negotiated business deals across the globe. I look forward to a full and fair confirmation hearing where Tillerson can describe his record in detail, and lay out his vision for supporting our allies, confronting our enemies and advancing U.S. interests worldwide." Cornyn also said Tillerson's experience at the helm of a big multinational corporation will serve him well on the world stage. "A lifelong Texan, I've long valued Rex's insight and look forward to supporting his nomination," Cornyn said in a statement. As they backed Tillerson, some Texas Republicans nonetheless acknowledged there may be questions surrounding his nomination. U.S. Rep. Pete Sessions of Dallas said in a statement that he looks forward to promoting Tillerson to his congressional colleagues and "extinguishing any doubts they may have about his intentions." Disclosure: Exxon Mobil and T. Boone Pickens have been financial supporters of The Texas Tribune. A complete list of Tribune donors and sponsors can be viewed here.